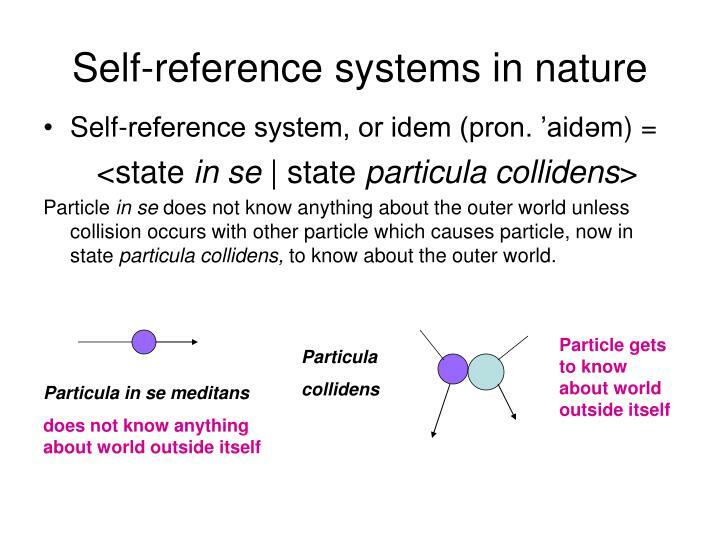 Particle in se does not know anything about the outer world unless collision occurs with other particle which causes particle, now in state particula collidens, to know about the outer world. 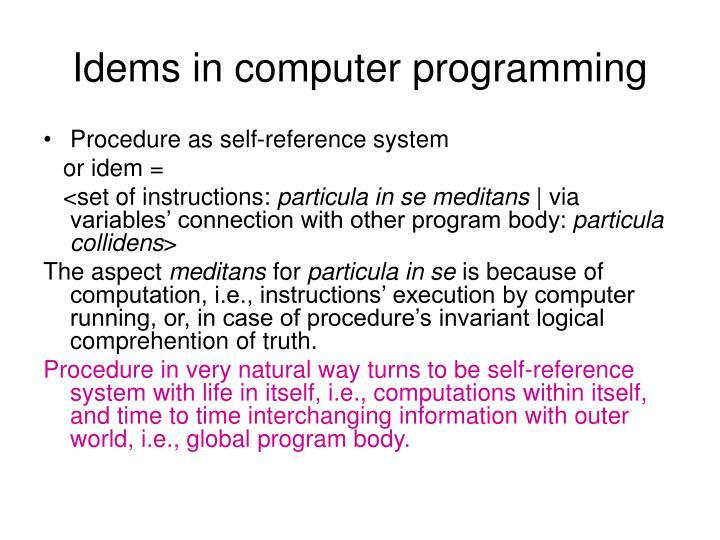 The aspect meditans for particula in se is because of computation, i.e., instructions’ execution by computer running, or, in case of procedure’s invariant logical comprehention of truth. 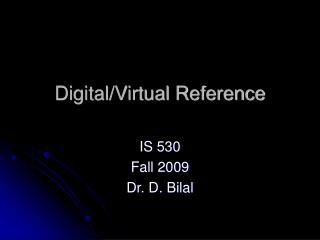 Procedure in very natural way turns to be self-reference system with life in itself, i.e., computations within itself, and time to time interchanging information with outer world, i.e., global program body. Aspect meditans comprise experience of lifetime. Aspect collidendae =particles that should be met, is interchangable with collidentes = particle’s self states by collisions in lifetime. 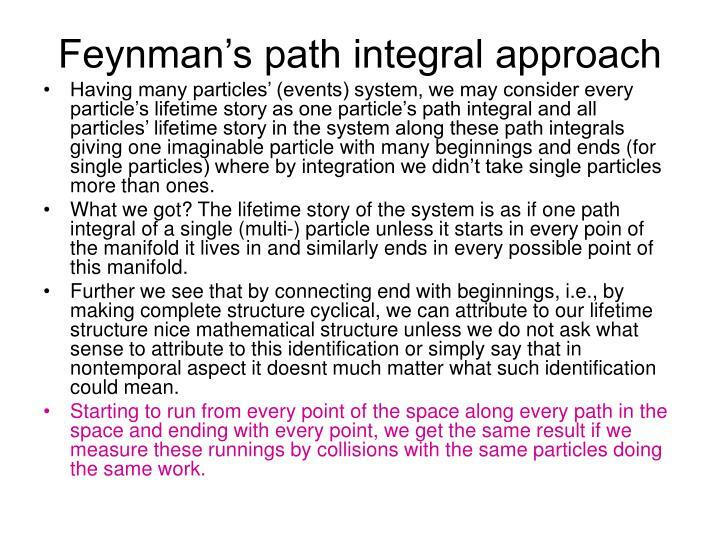 Following Feyman’s path integral concept we generalize lifetime history of many particles to one particle’s life: see next slide. When idem runs all possible states through which it interacts with world outside, it as if defines its integral quantity called quantum idem. Having many particles’ (events) system, we may consider every particle’s lifetime story as one particle’s path integral and all particles’ lifetime story in the system along these path integrals giving one imaginable particle with many beginnings and ends (for single particles) where by integration we didn’t take single particles more than ones. What we got? The lifetime story of the system is as if one path integral of a single (multi-) particle unless it starts in every poin of the manifold it lives in and similarly ends in every possible point of this manifold. Further we see that by connecting end with beginnings, i.e., by making complete structure cyclical, we can attribute to our lifetime structure nice mathematical structure unless we do not ask what sense to attribute to this identification or simply say that in nontemporal aspect it doesnt much matter what such identification could mean. Starting to run from every point of the space along every path in the space and ending with every point, we get the same result if we measure these runnings by collisions with the same particles doing the same work. Quantum idem imitates in infinitisimal scales actual field’s action as if mixed with small pieces of Euclid field. What could it give for calculations? Maybe it is already usual for researchers, but it could be extra motivation for them to find corresponding simpler idems: in this case: the action of two simple particles in form of some force which gives as path integral over lifetime story the actual field action. 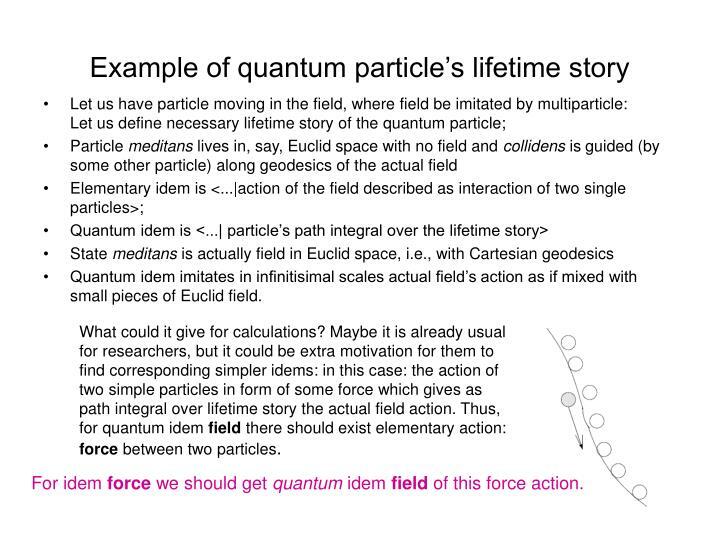 Thus, for quantum idem field there should exist elementary action: force between two particles. 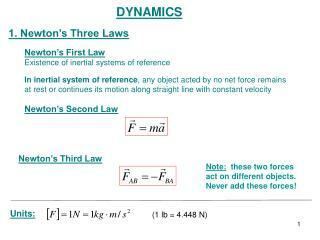 For idem force we should get quantum idem field of this force action. For example, for group theory state in se is ‘element’ and state collidens is ‘group operation’,then for quantum idem should stand idem group. This is not yet definition because we must specify state ‘group operation’ which should be idem itself. 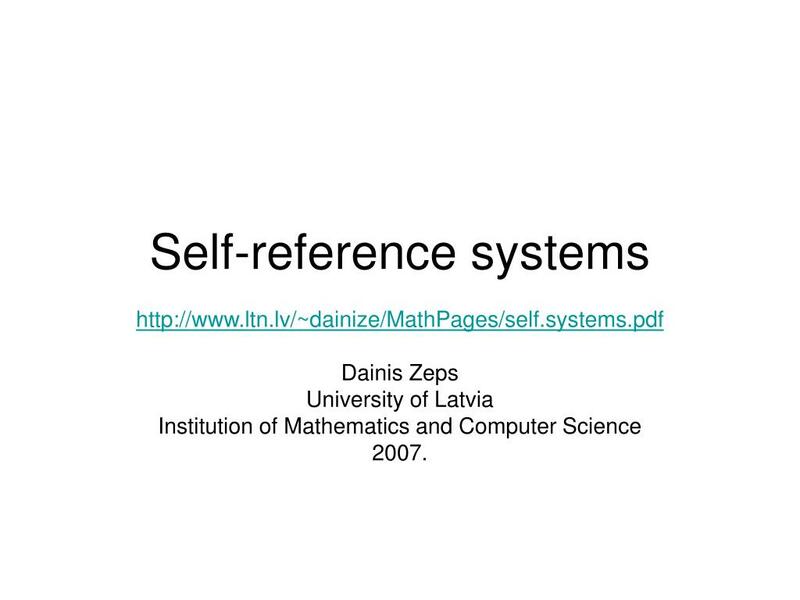 Categories best of all express idea around quantum self-reference system. Let theorem be imagined as an idem. 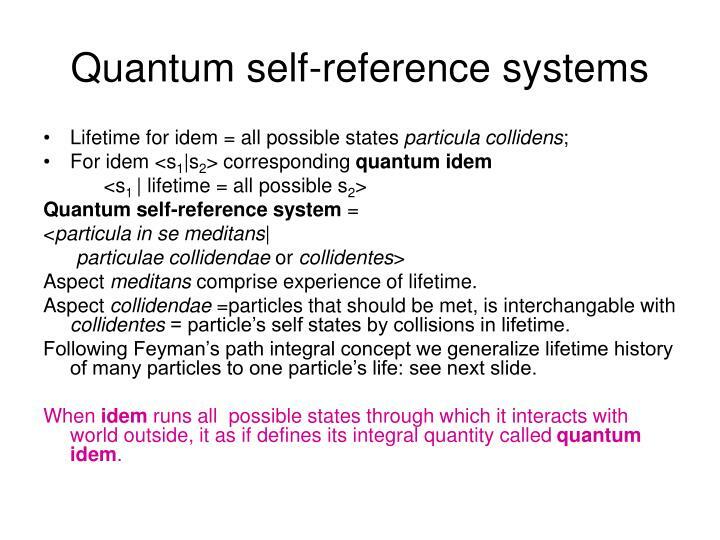 It already is quantum idem because of its nature to be abstract and applicable to its lifetime states’ set. This raises a question: can we always find corresponding elementary idem for any theorem considered as a quantum idem? If quantum idem is identic with it’s elementary idem then it would be already a good solution, i.e., where lifetime set is trivial. 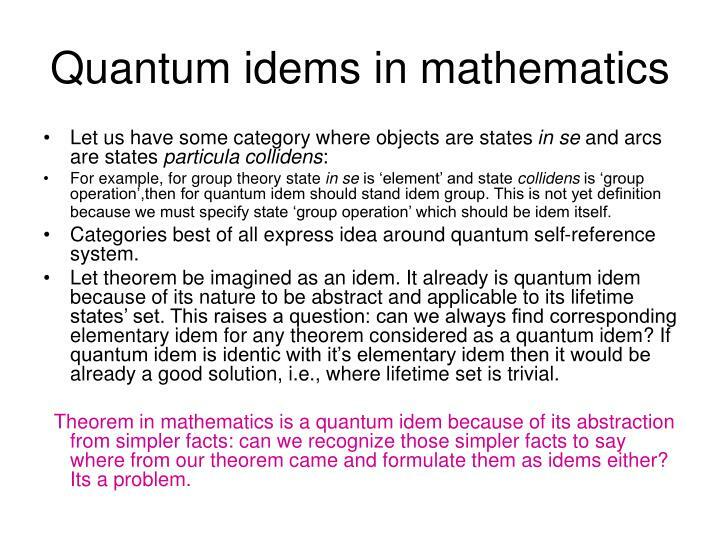 Theorem in mathematics is a quantum idem because of its abstraction from simpler facts: can we recognize those simpler facts to say where from our theorem came and formulate them as idems either? Its a problem. Mathematics is built from quantum self-reference systems. 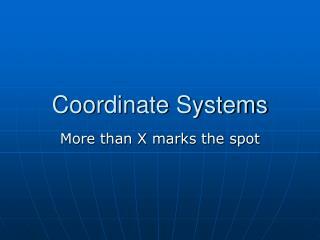 Mathematics is not built from oracle systems, i.e. ‘complete pictures’ from nature, or, we do not possess resourses for such perception. 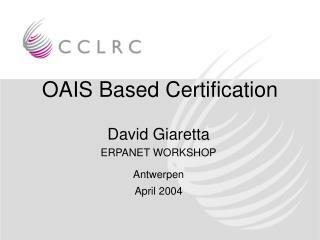 It is not excluded that mathematics could needs some elementary oracle systems, say, number one or zero in order to build some systems, e.g., for integers. 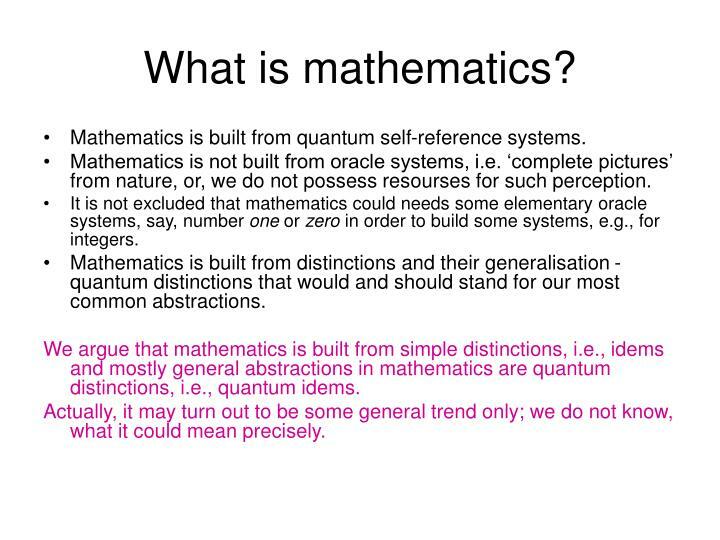 Mathematics is built from distinctions and their generalisation - quantum distinctions that would and should stand for our most common abstractions. We argue that mathematics is built from simple distinctions, i.e., idems and mostly general abstractions in mathematics are quantum distinctions, i.e., quantum idems. Actually, it may turn out to be some general trend only; we do not know, what it could mean precisely. 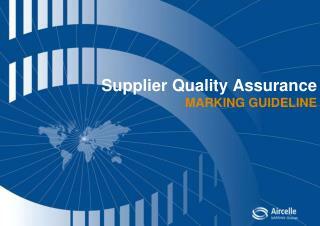 What this all is about? 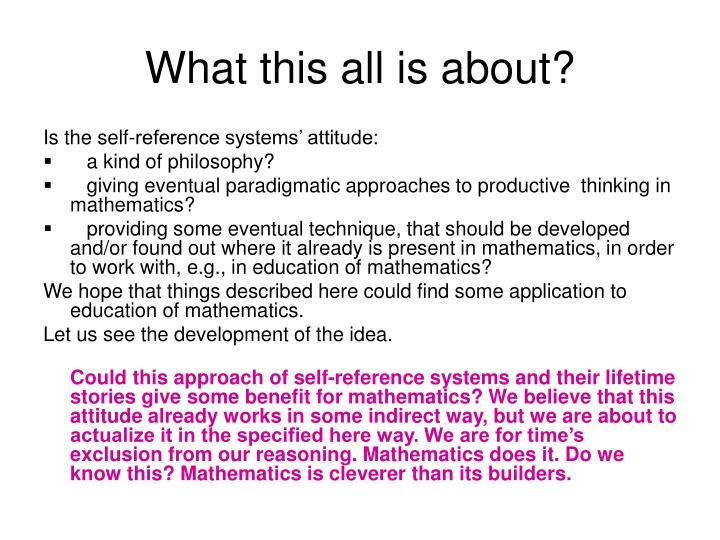 giving eventual paradigmatic approaches to productive thinking in mathematics? providing some eventual technique, that should be developed and/or found out where it already is present in mathematics, in order to work with, e.g., in education of mathematics? 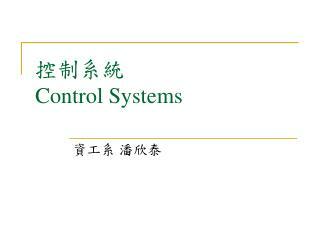 We hope that things described here could find some application to education of mathematics. Let us see the development of the idea. 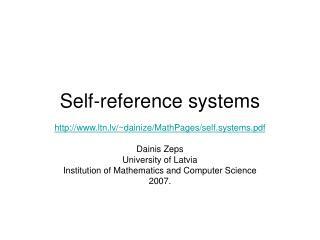 Could this approach of self-reference systems and their lifetime stories give some benefit for mathematics? We believe that this attitude already works in some indirect way, but we are about to actualize it in the specified here way. We are for time’s exclusion from our reasoning. Mathematics does it. Do we know this? Mathematics is cleverer than its builders. Let us have a lifetime story of 4 balls depicted as a multigraph where to the left it can be coded as combinatorial map, but to the right, without solved links or sinchronized events, should be coded using constellations, i.e. combinatorial map of higher order, both being two ways to describe multigraph. 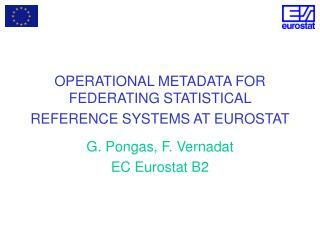 see Lando Sergei K., Zvonkin Alexander K., Graphs on Surphaces and Their Applications. Springer, 2003. This lifetime story of four balls’ mutual collisions can be considered as one idem as well, unless we are tempted to consider it as a self-contained or oracle system. 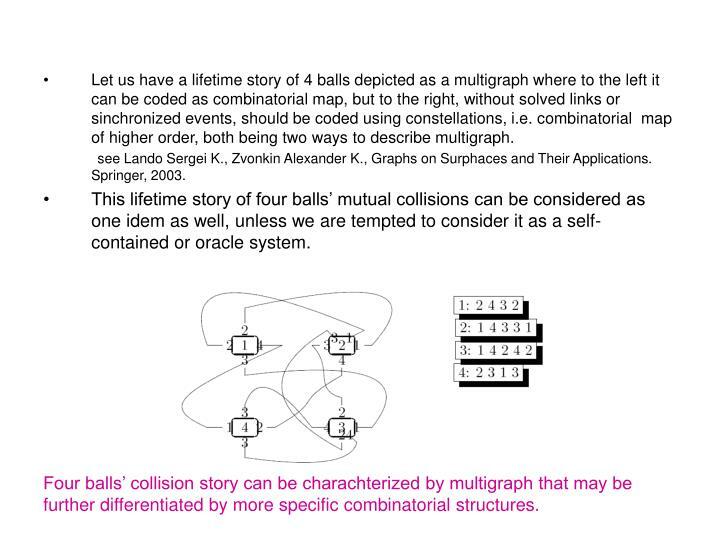 Four balls’ collision story can be charachterized by multigraph that may be further differentiated by more specific combinatorial structures. 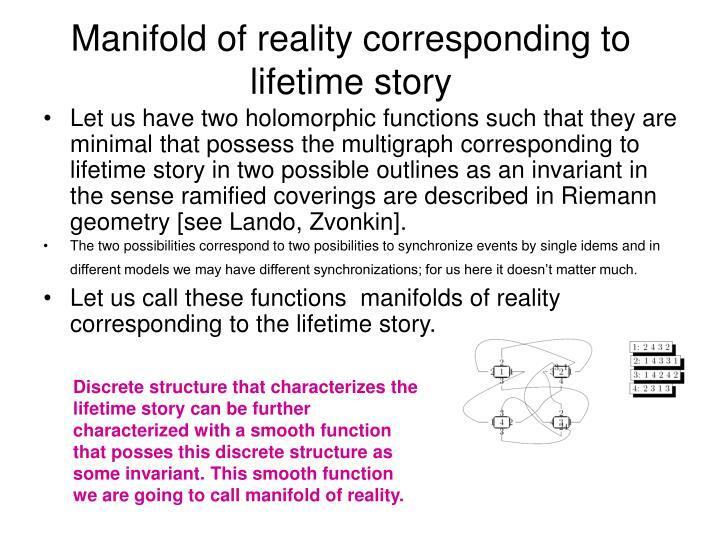 Let us have two holomorphic functions such that they are minimal that possess the multigraph corresponding to lifetime story in two possible outlines as an invariant in the sense ramified coverings are described in Riemann geometry [see Lando, Zvonkin]. The two possibilities correspond to two posibilities to synchronize events by single idems and in different models we may have different synchronizations; for us here it doesn’t matter much. Let us call these functions manifolds of reality corresponding to the lifetime story. Discrete structure that characterizes the lifetime story can be further characterized with a smooth function that posses this discrete structure as some invariant. This smooth function we are going to call manifold of reality. Either four balls’ hitting history or as many events as in lifetime of whole universe, we use the same discription for the idem of lifetime and corresponding to it the manifold of reality. We endow our universe with thinking aspect considering idems that constitute it possessing aspect meditans. Why? 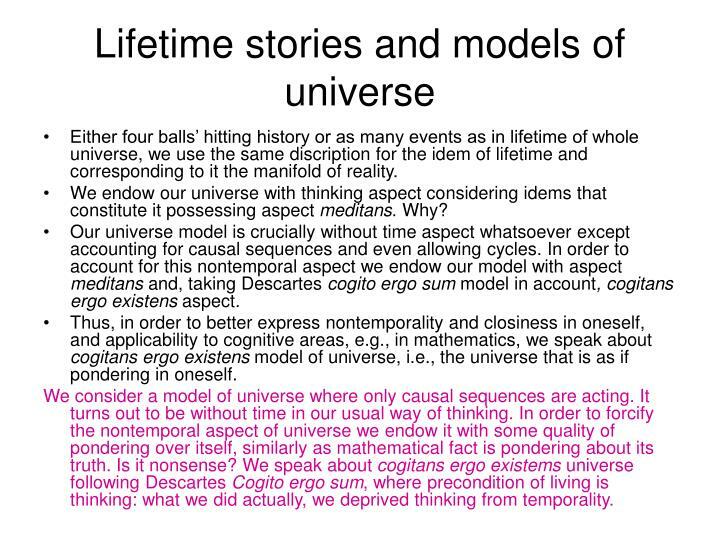 Our universe model is crucially without time aspect whatsoever except accounting for causal sequences and even allowing cycles. In order to account for this nontemporal aspect we endow our model with aspect meditans and, taking Descartes cogito ergo sum model in account, cogitans ergo existens aspect. Thus, in order to better express nontemporality and closiness in oneself, and applicability to cognitive areas, e.g., in mathematics, we speak about cogitans ergo existens model of universe, i.e., the universe that is as if pondering in oneself. 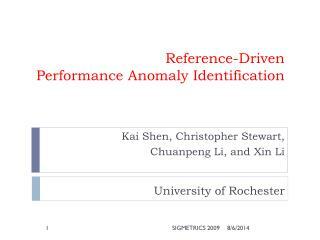 We consider a model of universe where only causal sequences are acting. It turns out to be without time in our usual way of thinking. In order to forcify the nontemporal aspect of universe we endow it with some quality of pondering over itself, similarly as mathematical fact is pondering about its truth. Is it nonsense? We speak about cogitans ergo existems universe following Descartes Cogito ergo sum, where precondition of living is thinking: what we did actually, we deprived thinking from temporality. Elementary idem should not be cyclical. E.g., procedure as a sequence of instructions, called once, is not cyclical; it starts with first instruction and ends with the last. As a quantum idem it is called many times and it is mere act of imagination to unify two moments in history, last and first, which in time sense does not really exist, in backwards order. In our history of universe this should be done once, i.e., unification of BB with BC, and we may even attribute this action to God to make our universe into holomorphic function. Maybe it is joke. But maybe quantum mechanists should love this kind of joke. What concerns particles (events) in nature, multiparticle taken as one quantum particle exists in its lifetime story as varied over all possible states, and, in order to see one particular particle in physical experiment, the one from many elementary lifetime threads should be chosen. Once more, unification of beginning with end should be redirected to one single occurance in the history of universe. 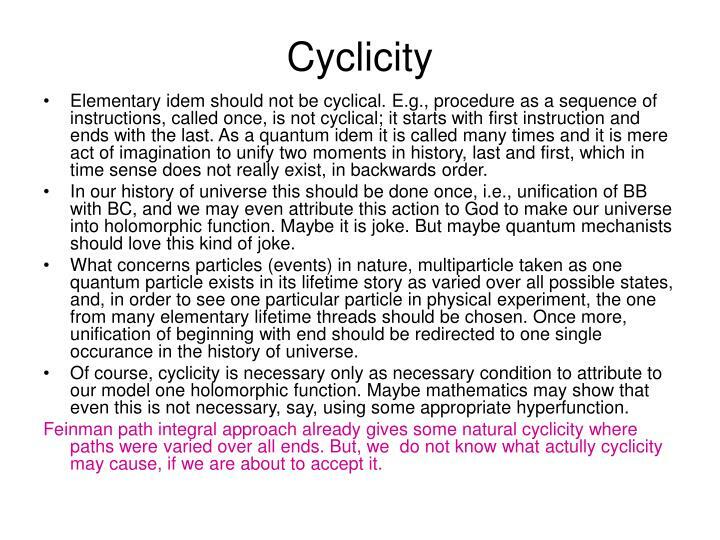 Of course, cyclicity is necessary only as necessary condition to attribute to our model one holomorphic function. Maybe mathematics may show that even this is not necessary, say, using some appropriate hyperfunction. Feinman path integral approach already gives some natural cyclicity where paths were varied over all ends. But, we do not know what actully cyclicity may cause, if we are about to accept it. If cyclical quantum one-particle could be accepted from quantum physicists, then this paradigma could be used elsewhere in a like way. Another possibility, if physicists decide causal cyclicity to redirect through matter’s geometry, i.e., inerciality putting as geometric outcome of geometry of physical vacuum [see Rueda, Haisch]. Maybe this shouldn’t be separated from the previous case. Last most possible option is that we are not used to think in terms of causal cycles except what concerns time mashines. It might sound nonsense, but the last is the most possible. We want using time mashine ideas send us as wave packets in whatever direction possible, but we must start otherwise: to find the way nature does this in its very natural way in order to see then, what could it mean for our desire to make time travels. 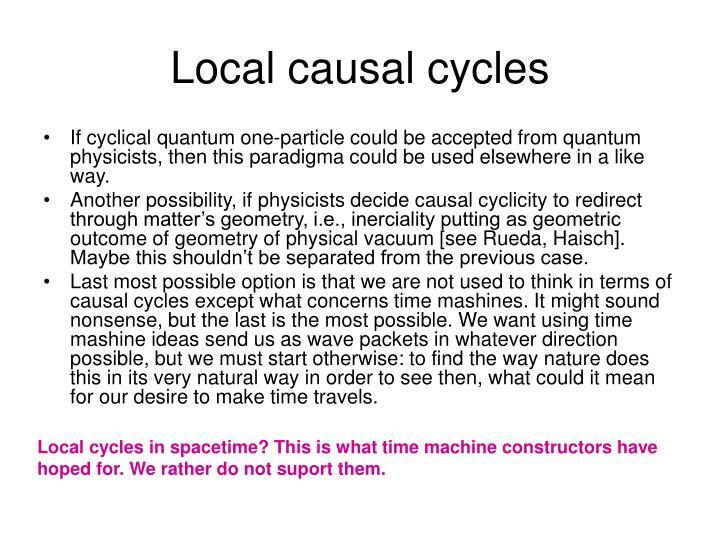 Local cycles in spacetime? This is what time machine constructors have hoped for. We rather do not suport them. This model of universe is in very crucial way non temporal. 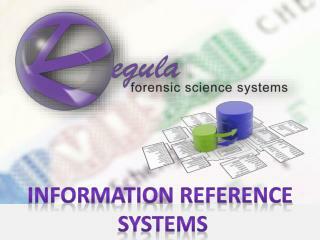 Of course, it accounts only for causal sequences, and in this sense time is represented by event sequences. One would ask, what we have otherwise than usually suggested about time to be? But wait, our model is multidirectional and cyclical, even locally cyclical. 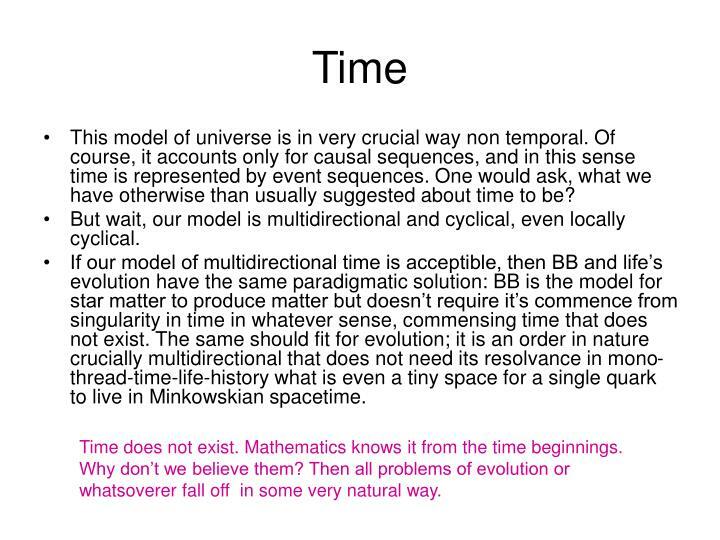 If our model of multidirectional time is acceptible, then BB and life’s evolution have the same paradigmatic solution: BB is the model for star matter to produce matter but doesn’t require it’s commence from singularity in time in whatever sense, commensing time that does not exist. The same should fit for evolution; it is an order in nature crucially multidirectional that does not need its resolvance in mono-thread-time-life-history what is even a tiny space for a single quark to live in Minkowskian spacetime. Time does not exist. Mathematics knows it from the time beginnings. Why don’t we believe them? Then all problems of evolution or whatsoverer fall off in some very natural way. Nature and cognition share the same general pattern, cogitans ergo existens universe pattern. It doesn’t much matter that we say that universe does not know the rules it is built by. The universe behaves as if it knows. One would say, this occurs only in our cognition, because we can’t see nature otherwise as we use to see it? 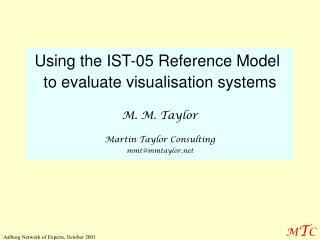 The idea may be interpreted as mere play of imagination, but the pattern is too general and, in case we can never lieve it as long we belong to it as long we live in the world, i.e., we are self-reference systems ourselves with our I-thinking, it should be accepted on equal rights with that commonly in use, i.e., of us being part of objective nature and only occasional products of it. 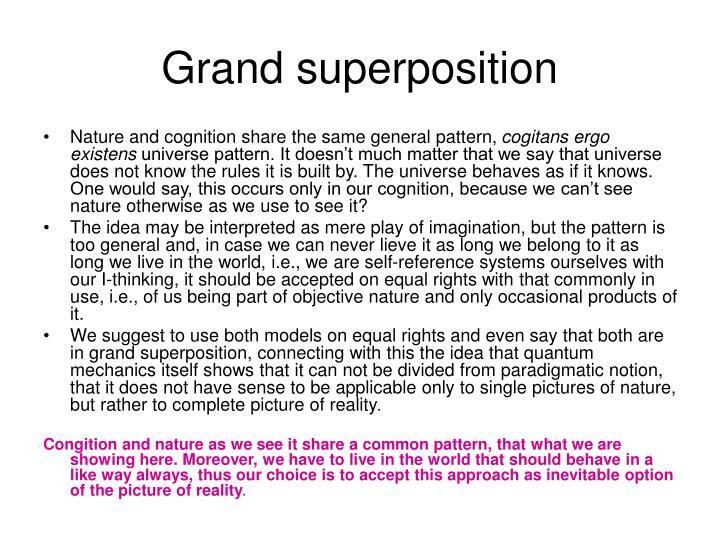 We suggest to use both models on equal rights and even say that both are in grand superposition, connecting with this the idea that quantum mechanics itself shows that it can not be divided from paradigmatic notion, that it does not have sense to be applicable only to single pictures of nature, but rather to complete picture of reality. Congition and nature as we see it share a common pattern, that what we are showing here. Moreover, we have to live in the world that should behave in a like way always, thus our choice is to accept this approach as inevitable option of the picture of reality. 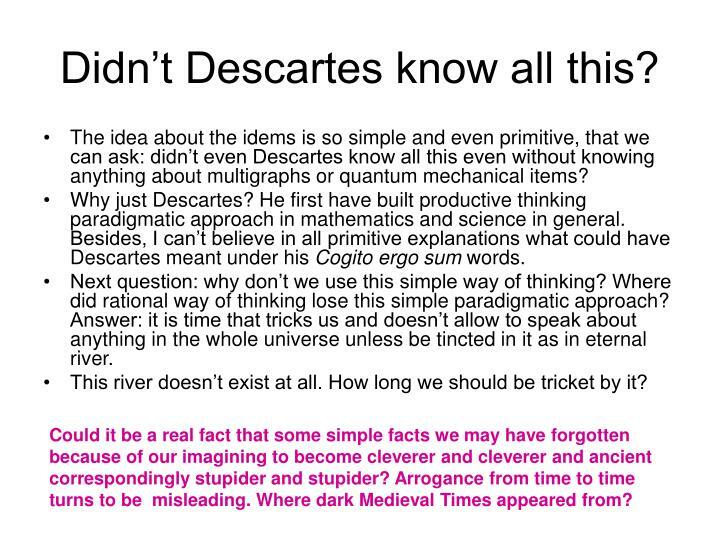 Didn’t Descartes know all this? 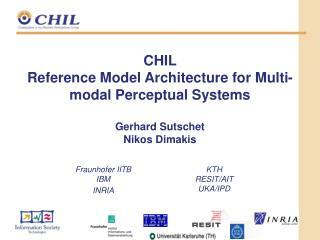 The idea about the idems is so simple and even primitive, that we can ask: didn’t even Descartes know all this even without knowing anything about multigraphs or quantum mechanical items? Why just Descartes? 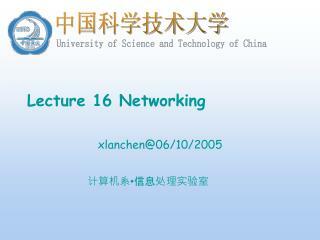 He first have built productive thinking paradigmatic approach in mathematics and science in general. Besides, I can’t believe in all primitive explanations what could have Descartes meant under his Cogito ergo sum words. Next question: why don’t we use this simple way of thinking? Where did rational way of thinking lose this simple paradigmatic approach? Answer: it is time that tricks us and doesn’t allow to speak about anything in the whole universe unless be tincted in it as in eternal river. This river doesn’t exist at all. How long we should be tricket by it? Could it be a real fact that some simple facts we may have forgotten because of our imagining to become cleverer and cleverer and ancient correspondingly stupider and stupider? Arrogance from time to time turns to be misleading. Where dark Medieval Times appeared from? 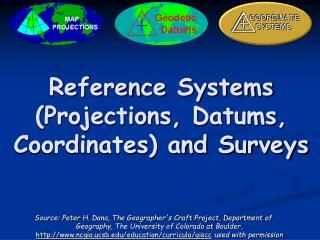 Datum Planes -Specify the origin, x, and y directions. 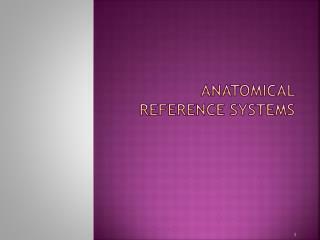 select the reference geometry. 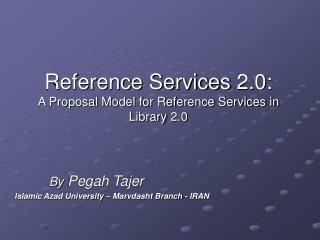 reference point. 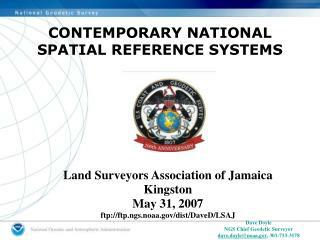 reference axis. 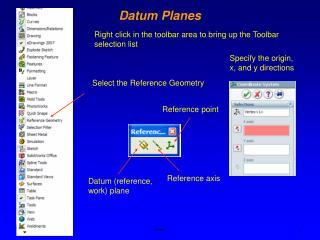 datum (reference, work) plane. datum planes. right click in the toolbar area to bring up the toolbar selection list. 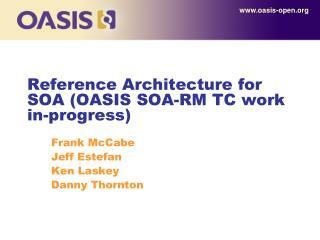 Reference Architecture for SOA (OASIS SOA-RM TC work in-progress) -. frank mccabe jeff estefan ken laskey danny thornton. agenda. * minutes. introduction. 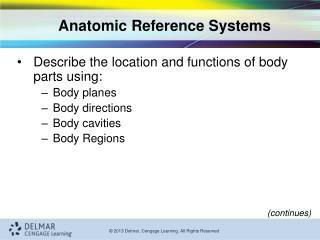 soa as eco system primary concepts from reference model plan for the tutorial. 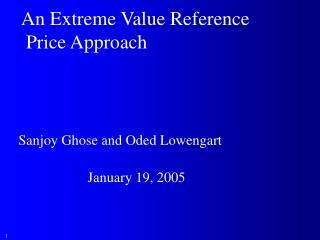 An Extreme Value Reference Price Approach -An extreme value reference price approach. sanjoy ghose and oded lowengart. january 19, 2005. effect of price on choice. 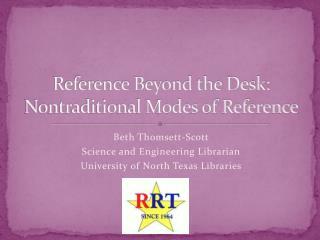 price only models inclusion of reference price. reference price categories.